There are many reasons not to visit the gym and these Body Revolution Dumbbells gives you another excuse to stay at home. Why pay expensive gym membership when you can easily replicate training routines in the comfort of your own home. Body Revolution dumbbells provide a fantastic way to tone your muscles, increase endurance and keep fit. 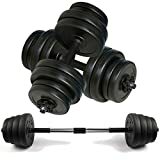 The versatility of this dumbbell set means you can do a wide range of exercises and offers excellent value for money. The Body Revolution Dumbbell set is the ideal solution for anyone interested in engaging in a serious weight-training program, and who needs to optimize their fitness space. Free weights, such as dumbbells, are a simple and effective way to strengthen and tone the entire body. Totally versatile you can use dumbbells on a weight bench, stability ball, Bosu ball or on the floor to increase muscle strength and definition throughout the body. Incorporate them into Crossfit or Circuit Training to further engage the muscles, boost endurance and raise the heart rate.